Now, artists and musicians who worked with David Bowie during his lifetime - or who were his contemporaries - pay tribute to the icon through their own words on what it was like to work in collaboration with a man whose fluid artistic genius repeatedly broke boundaries, right up until his death. Alongside these text tributes are 40 stunning illustrative and photographic portraits of Bowie throughout his career. The contributing artists and photographers include (alphabetically): Edward Bell, Derek Boshier, Anton Corbijn, Kevin Cummins, Chuck Connelly, Chalkie Davies, Stephen Finer, Greg Gorman, Derry Moore, Terry O'Neill, Mick Rock, Masayoshi Sukita, George Underwood, Justin de Villeneuve and more. 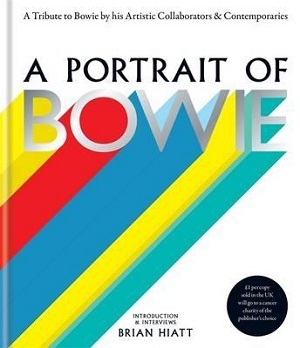 Alongside these remarkable portraits are insightful, personal written pieces by his contemporaries, and musicians and artists who worked closely with Bowie, including Zachary Alford, Carlos Alomar, Toni Basil, Gail Ann Dorsey, Mike Garson, Dana Gillespie, Debbie Harry and Chris Stein, Cyndi Lauper, and Nile Rodgers, among others.